Someone should check in on the guy. The election of Donald Trump has emotionally affected nearly everyone, some more so than others. Among those in the more-so-than-others camp is, judging from his fevered tweets of late, New York Times columnist and Nobel laureate Paul Krugman. 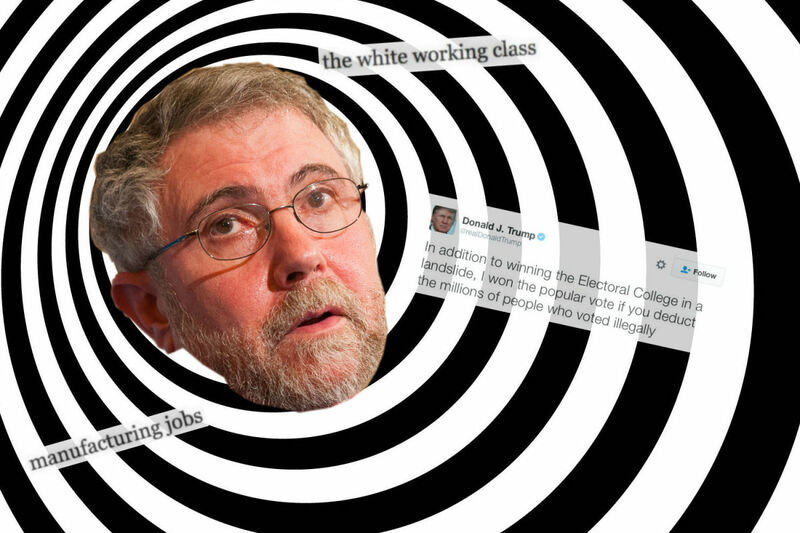 Krugman has received more than enough guff for his questionable recent political takes, like the suggestion that James Comey and Vladimir Putin “installed” Trump in the White House. For Krugman, political commentary is merely an avocation. By training, he’s an economist. Which makes it all the more concerning that Krugman whiffed on matters of basic economics several times in one day Tuesday. Flailing around in political commentary is part of what makes Krugman so endearing. Flailing around in his wheelhouse is troubling. By his initial calculation, something like 4 million whites who gained insurance under Obamacare voted for Trump. How did he get to that number? Take the 6 million non-Hispanic whites who were insured between 2013 and 2015, then multiply that by the percentage of these who voted Trump. That’s 57 percent for whites overall, 66 percent of whites without a college degree (a common shorthand for working-class whites). Shortly after hitting publish, Krugman started to doubt himself. In one update to the article, he used a better data source to find it was actually 8.5 million “working-class whites who stand to lose health insurance under Trump,” yielding an estimated 5.5 million Trump chumps. But then – “gah” – he discovered another error and brought the number back down to 3.5 million again. In a final update, he returned to the estimate of his first update and stood firm at 5.5 million. That’s dizzying enough. But there was one humongous error he never caught: accounting for turnout. Not every one of the 8.5 million or so whites who got insurance in the past few years voted. Many, in fact, did not. When exit polls say 66 percent of non-college whites voted Trump, that means 66 percent of those who voted, not of overall citizens. In 2016, turnout is somewhere shy of 60 percent at present count. Of the 8.5 million potential Trump chumps, only about 5 million voted. Of those 5 million voters, let’s say 66 percent picked Trump. That gives us around 3.3 million Trump chumps. The initial estimate was right. For all the wrong reasons. This was back-of-the-envelope stuff, admittedly, and electoral politics isn’t Krugman’s strong suit. Plus he was contrite on Twitter. But it wasn’t the only time time Krugman swung and missed Tuesday. Earlier in the day, Krugman tweeted out a graph that showed manufacturing employment dropping as the share of manufacturing in the economy kept relatively constant. Translation: We still make stuff in the U.S., but we need fewer people to do it. Vox has made much the same point, the implication being that even if Trump brings back manufacturing, it won’t translate to a renaissance in manufacturing jobs. Tedeschi’s chart tells a much different story. Krugman’s makes it seem like manufacturing has barely budged relative to the overall economy. 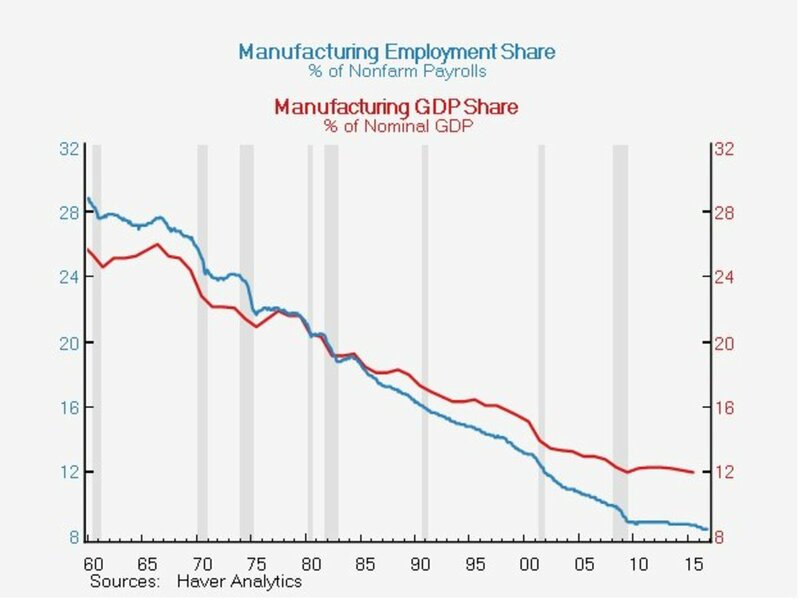 In reality, as Tedeshi’s chart shows, manufacturing really has declined compared to everything else. The issue has to do with how the Bureau of Economic Analysis tabulates data. To show an output trend as a share of the broader economy, it’s a no-no to use the government’s “real,” inflation-adjusted data. When dealing in ratios, the right thing to do is use nominal, unadjusted dollar amounts. The reason has to do with how the “real” data is aggregated, a method that throws ratios out of whack. Krugman should probably know this! It’s economics, after all – and not political theory – that won him the Nobel, and it’s his crusade against voodoo economics that made him a liberal darling. Now he can’t tweet three times in a row without tripping over himself. You OK, Krugs? Wanna drop us a line? We&apos;re thinking about you.